Stock photo of large boulders which are sandstone concretions formed in prehistoric seas seen in the Red Rock Coulee Natural Area situated 65 km southwest of Medicine Hat on Highway 887, Alberta, Canada. These large sandstone concretions sit in the Red Rock Coulee Natural Area. 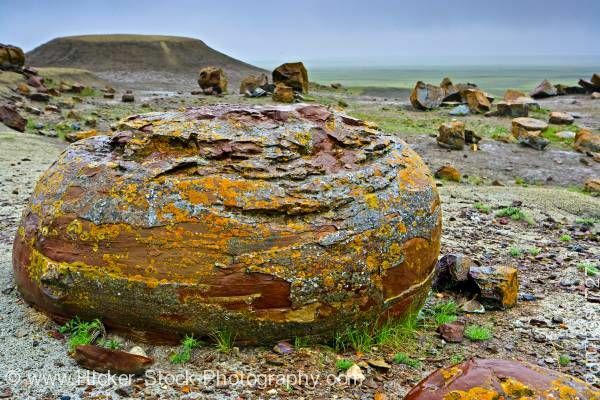 This stock photo shows the large boulder formations which are sandstone concretions formed in prehistoric seas seen in the Red Rock Coulee Natural Area situated 65 km southwest of Medicine Hat on Highway 887, Alberta, Canada. These large formations are seen in the Red Rock Coulee Natural Area. The amazing and large sandstone concretions were formed in the prehistoric seas now sits upon the large valley. The concretions vary in size and shape. The large boulder in the foreground has layers of colors along with crevices and chips. The boulders sit in an open wet rocky valley with small patches of grass. Large Boulders which are sandstone concretions formed in prehistoric seas seen in the Red Rock Coulee Natural Area situated 65 km southwest of Medicine Hat on Highway 887, Alberta, Canada.